After several weeks of successfully dodging fierce criticisms and political bullets aimed at removing him from the unelected office of vice presidency, Victor Bockarie Foh (Photo) has nailed himself unto his office desk, as well as pinned his mast at State House. But those calling for president Koroma to rescind his decision to sack the legitimate and elected vice president Sam Sumana, are refusing to give up their peaceful protests. They want Victor Foh out and president Koroma himself impeached. Next week, the rank and file of the ruling APC party will meet, to discuss the president’s unconstitutional behaviour. The outcome is uncertain. 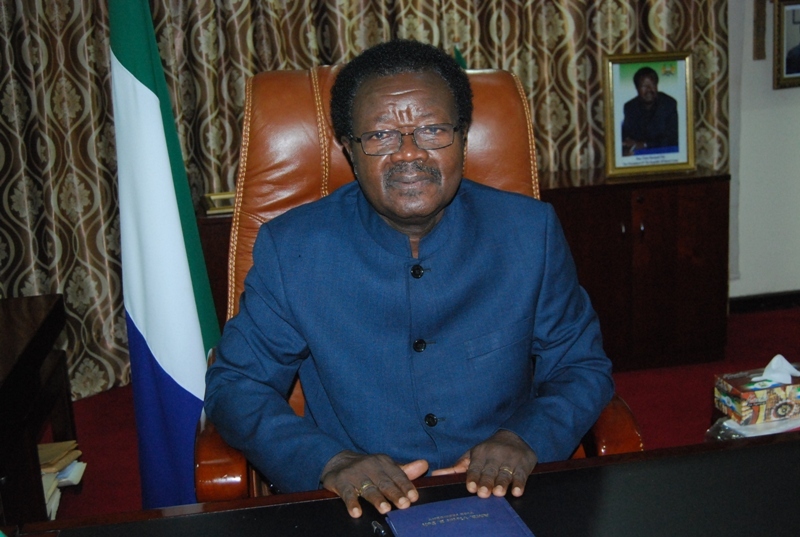 In the meantime, according to John Baimba Sesay, Victor Foh continues to show his unflinching loyalty and gratitude to president Koroma, for the reward he has received from the president. The last two weeks have been quite impressive, busy and result oriented especially from the viewpoint of what vice president Victor Bockarie Foh did in supporting the president in his desire for a better Sierra Leone. Vice president Foh is doing just what he should in tandem with the wishes of president Ernest Bai Koroma – from schools’ visitation within the capital city of Freetown, to visiting various Districts Ebola Response Centers in Port Loko and Kambia. And, at the political front, he did all he could to bring back memories of the outstanding role fulfilled by the late SI Koroma, CA Kamara-Taylor and Siaka Stevens in the political growth and survival of Sierra Leone and the All People’s Congress (APC). Vice president Victor Bockarie Foh’s political pedigree is something that upcoming young politicians should emulate. His dedication, loyalty and commitment to the core values and philosophy of the governing All People’s Congress could serve as a reservoir of political philosophy and knowledge that should be tapped into. In party politics, loyalty plays a crucial role. This is so because, the very survival of a political party depends on how loyal and committed its members are to their leadership. Loyalty is one foundation upon which the APC was built and upon which it continues to stand and grow. VP Foh has made clear his determination to remain loyal to the leader and chairman of the party – Dr Ernest Bai Koroma and the APC Party at all times. This is very good for the Party. The same is expected in the coming days in Tonko Limba for the late CA Kamara-Taylor and Siaka Stevens of blessed memory. VP Foh is a politician and an astute one as a matter of fact. Say it, loud and clear, Victor Bockarie Foh is just too loyal to the APC and its leadership. Then move away from his pedigree in Party Politics (for governance is not all about politics), and see what he could do in terms of promoting our country’s development agenda. Vice president Foh is a team player who believes in collective decision making. He believes in continuous engagement of all stakeholders in a bid to meet the expected goals for a better Sierra Leone. The Vee Pee has demonstrated that he is a grass roots politician in his meetings with traders, as well as during his visits to a number of schools in Port Loko, Kambia and Western Area, where he spoke of the need to fight against Ebola, government’s post Ebola recovery plans, and the need for a united front towards the country’s development. The schools visitation exercise promoted rebuilding of public confidence in our education system and encouraging all parents to send their children to school, to benefit from government’s good will to pay tuition fees for all children in government and government assisted schools. He also admonished teachers and lecturers to give their best to their respective institutions, while at the same time reassuring them that they are important in the country’s development process. 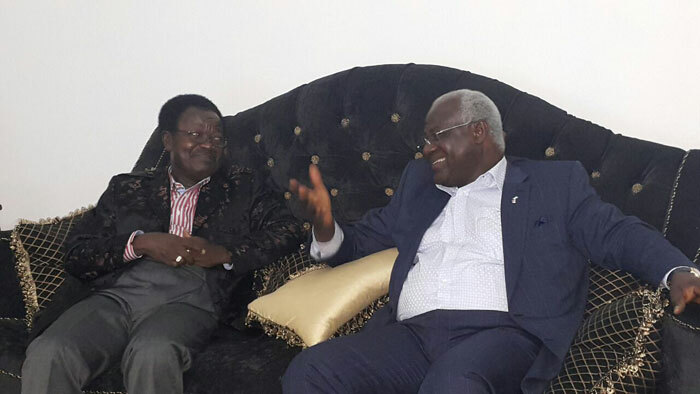 The president – Dr Ernest Bai Koroma has laid the foundation for a better Sierra Leone. The Vice President is here to work and support the president, not to disagree with the president. VP Foh comes in to add value to the presidency. You can extol ‘vouchergate’ Foh all you want Mr. Information Attaché, but the fact is that he is illegally occupying the position of an elected official of the state, and no amount of praise-singing will change that. He being invited to schools does not change that fact either. I wonder how people like you, who claim to be journalists would be corrupted by the official position you currently occupy in government. Are you serving the people of Sierra Leone or Ernest Koroma? All this thief talks about, since he was selected as vice president is his loyalty to the APC. What about trying to be loyal to the people of Sierra Leone by gracefully relinquishing a position that is fraudulently given to you by someone who thinks he is emperor of Sierra Leone? So Mr. Information Attaché, spare us your subjective, bias, one-sided reportage. Foh may have all the qualities ascribed to him in this article, but this does not legitimize the disregard for the constitutional process. If the framers of the Sierra Leone constitution wanted to leave it to the supreme authority of the president, why did they take their time to outline the process for removing a VP? This issue is not about defending Sam Sumana, but about democracy and the constitutional process. It’s interesting that those who are protesting are being called unpatriotic for insisting that the current government respect the constitution and be accountable, but the ones who created an environment which calls for these protests want to be hailed as national heroes. Speaking out against what one believes to be injustice does not mean you are unpatriotic. In the Sierra Leonean context where there is often the threat of retaliation, people have shown incredible strength and patriotism on these current issues. It is good that the elected VP Sumana is legally challenging EBK’s supreme authority. Sierra Leone is not a monarchy and EBK is not God, so I don’t believe he has the right or legal authority to unilaterally remove an elected VP. If that were the case, I believe it would explicitly say that in the constitution and there would be nothing to debate.